I've had a go a few times on this blog before about novels that come with overwhelmingly positive review grabs on the front and back covers and introductory pages. They rave about what a 'groundbreaking', 'unforgettable' read it is, etc, etc. 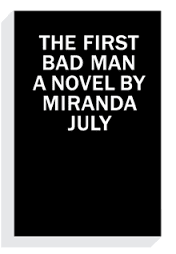 This 'debut' (another cliche) novel from indie filmmaker, artist and short story writer Miranda July is heralded by none other than George Saunders, Dave Eggers, Lena Dunham and A.M.Homes. Their guff is hollow. Here's the truth: this novel is a dud because it's profoundly boring in the way that edgy, quirky, indie characters are boring when they are just annoying and shallow and only interesting because they're 'unconventional'. There's nothing happening in this novel that isn't recycled from just about every good situation comedy you've seen on TV. It's the story of a single, middle-aged woman, Cheryl, who is a pathological masturbator. She's a grotesque, conniving, completely deluded fantasist. A pathetic, needy, husk of a woman. She's madly obsessed with a 63 year old work colleague, Philip, who takes her into his confidence about his infatuation with a 16 year old girl and their sexual explorations, and who needs Cheryl's 'permission' before he feels free to pork her. Cheryl fantasises she's Philip, thrusting his rigid rod into the poor teenage girl's every orifice, and she's at it 24/7. All the characters - new age work colleagues and dopey psychiatrists who are, typically, as crazy as their patients - are wacky, unconventional, and frankly, profoundly annoying. The central plot point is Cheryl's love affair with the 20 year old daughter of the ridiculous husband and wife act who run the company Cheryl has diligently worked for for yonks. For some reason she has been asked to look after her for a while. This grotesquely immature lump of a young woman sits all day in front of the TV chomping junk food, sucking sodas, farting, reeking of BO and grunting. Then she gets pregnant to some never disclosed youth. The baby, Jack, turns out to be the most mature and normal human in this circus, and guess what, Cheryl is stuck with him because the lump disappears. Am I interested any more? Philip's 16 year old ditches him of course, so he leans on Cheryl for comfort and the odd root. It's not like her masturbatory fantasies, however. Far from it. Reality intrudes big time, and it doesn't last. Here's my grab for the front cover: 'I wasted two days reading this cliched, meaningless rubbish'.